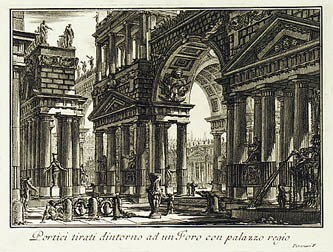 An etcher, engraver, architect, archeologist and theorist, Giovanni Battista Piranesi created a unique vision of ancient Rome that has inspired writers and poets as much as artists and designers since the 18th century. Born in Venice in 1720 and trained as an engineer and architect, Piranesi also studied perspective and stage design. The combination of these skills, along with his deep knowledge of archaeology, provided the background for hundreds of etchings of ancient and contemporary Rome. Published from 1745 onwards, these works established a thoroughly romanticized image of the city. The scenes are invested with drama from the exaggerated contrasts of light and shadow, and the exploitation of scale makes the buildings appear large and grand. Piranesi’s work has always been extremely popular and his etchings are still actively collected today. Sometimes referred to as the Ten Small Architectural Fantasies, these works shown here were produced as a set for traveling noblemen and connoisseurs. Sets such as this one were frequent gifts from the Pope to distinguished guests.